Supplementary material reads: "From: Jim Rowe. Richfield Oil Corp. Madison 9-4111, Home: HO. 7-2497. Art with Million Mile Driver Martin. Don't change your luck suggest Richfield Oil Corporation officials to Don M. Martin, transport driver. Martin drove for 13 years and 1,000,000 miles without an accident. Company officials J.T. Foster (L), and A.E. Patton, (R), presented engaved [sic] gold watch and gold buckle attesting the exceptional safety record. 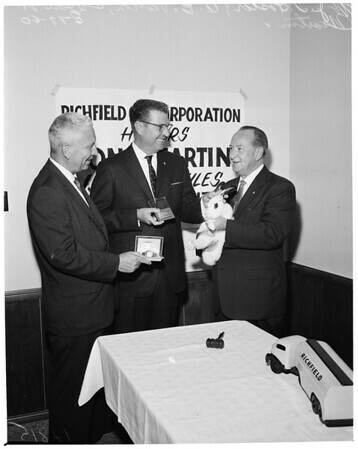 Oh yes, they brought pet Pete Roleum to Mascot Martin -- four rabbits feet instead of one."